St John the Baptist Greek Orthodox Church stands on the south-east corner of Wightman Road and Lausanne Road, on the eastern edges of Hornsey. 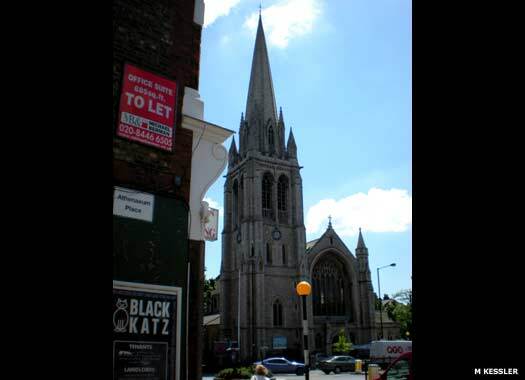 The church was founded as the Parish Church of St Peter in October 1884 to serve the residents of a series of streets which were being built up with terraced housing and which came to be known as 'The Ladder', which is the appearance it gives when viewed on a map. A hall was added on Frobisher Road in 1930. The nave was built in 1896-1898 by James Brooks & Son; the east end in 1904-1919 by J S Adkins. 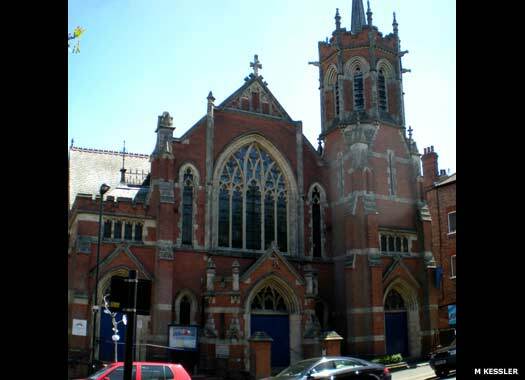 The building is in the Arts-and-Crafts Gothic style with low, pent aisles to the nave, and a large west window flanked by projecting square towers. No longer needed in the 1970s, the church was closed, and in 1974 was given a Grade II listing. The Greek Orthodox Community of St John the Baptist took over the abandoned church, and re-opened it on 5 October 1980. 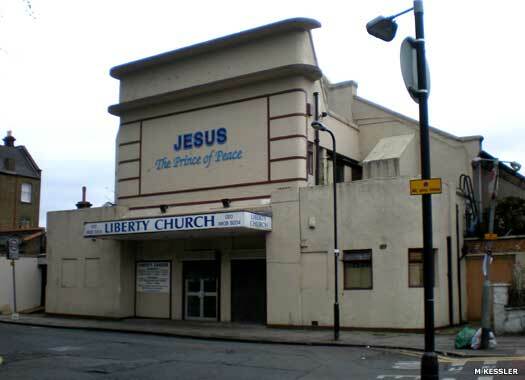 Liberty Church Hornsey stands on the southern side of Frobisher Road, opposite Willoughby Road. In the very early 1900s, William Day showed films in the Olympia Gardens next to the Queens Head pub (which still stands, to the left of this photo). By the end of the decade Harringay's first real cinema had been built on the grounds. 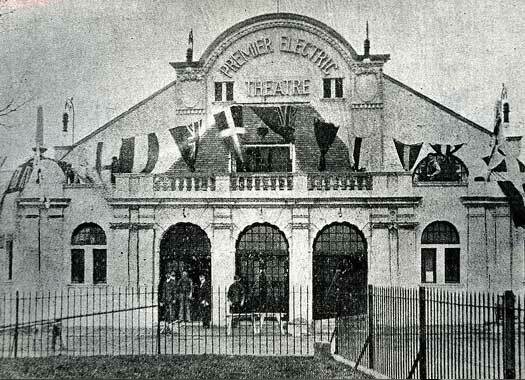 The 'Premier Electric' opened on 16 April 1910. In the early 1930s the River Park Company took over, shortening the name to the 'Premier'. Gaywood Cinemas took over in 1938-1954, completely refurbishing it in the art deco style, renaming it the 'Regal'. Further changes featured: a Newcastle-based company named it the Essoldo in 1954; it closed on 10 November 1963 but a try at bingo failed; between 1964-1989 it was reopened as the Curzon, then as a Quasar game centre in 1990-1996. 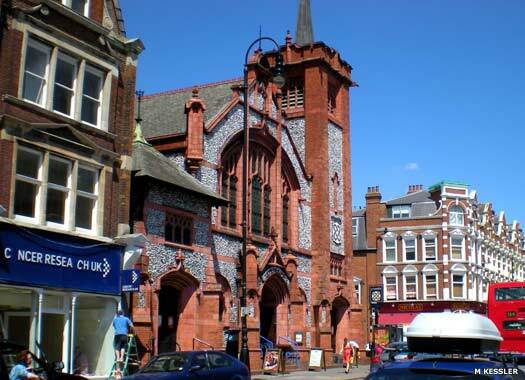 In 1996-1997 it was the Church of Destiny, then a Bollywood cinema in 1997-2003. Liberty Church moved in just after that. 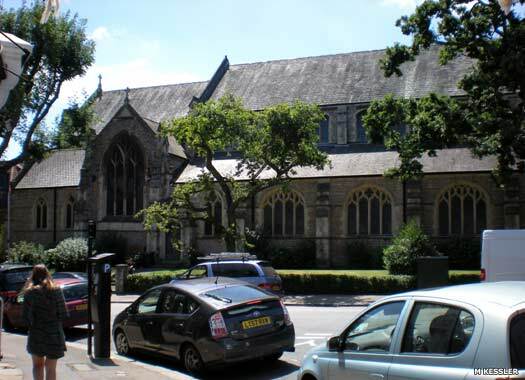 St James Muswell Hill is on the southern corner of the junction between Muswell Hill Road and St James' Lane, close to the Broadway. The land was given by Henry Warner and in 1842 an unoriented church (not built facing east to west) was built in white brick in the Early English style. The design was by Samuel Angell with a nave seating 432, a shallow chancel, and diminutive tower and spire. In 1874 the nave was extended and a north aisle added at great expense. Since the church was too small and in a dangerous condition in 1898, J S Alder designed a new church in Ancaster stone, with Bath stone dressings in a Perpendicular style. 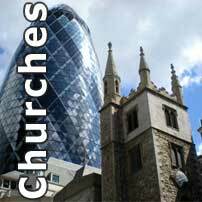 Most of the new church was consecrated in 1901, the rest in 1902, and the tower and spire in 1910. It was gutted during the Second World War but by 1952 had been restored by Caroë & Partners with seating for 800. In the interim services were held in a temporary structure in the nave. 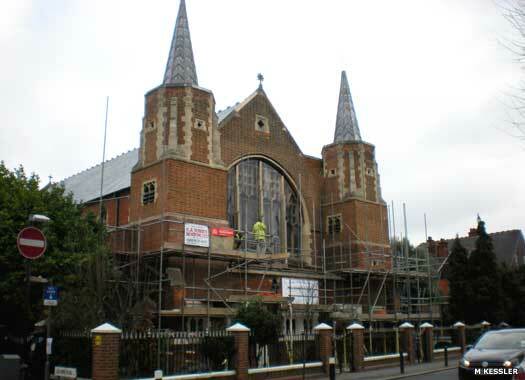 Muswell Hill Presbyterian Church is at the western side of Muswell Hill Broadway, on the Princes Avenue corner. The flint and terracotta building, with hard red Ruabon brick and late Gothic and art nouveau features, was built in 1902 to a design by G Baines, which later led to a campaign for its preservation following the Presbyterians/Congregationalists 1973 merger. It was converted into a public house in 1997, while the hall behind is now residential flats. Muswell Hill Baptist Church is just the other side of the Broadway, on the north-eastern corner of Duke's Avenue and Mews. The chapel, with a hall beneath, was founded in 1901 and registered in 1902, built in red brick with stone dressings in a Decorated style. Its tower is surmounted by an octagonal lantern, with a spirelet, while inside was seating for about 800, later reduced to 750. 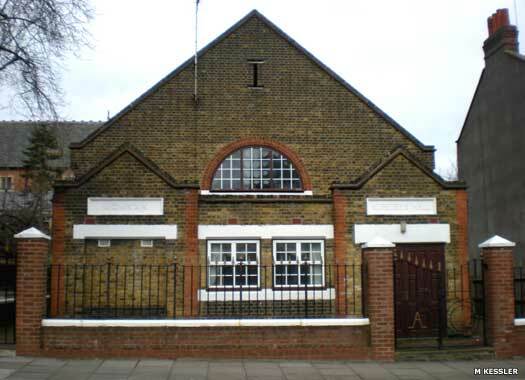 A hall for young people was opened at the rear of the church in 1957. Seven photos on this page contributed by M Kessler. Additional information from Images of England: Highgate and Muswell Hill, Joan Schwitzer & Ken Gay, The History Press 2014.